0-7 weeks -Neonatal, transition, awareness, and canine socialization.Puppy is with mother and litter mates. During this period, puppy learns about social interaction, play, and inhibiting aggression* from mother and litter mates. Puppies must stay with the mother and litter mates during this critical period. Puppies learn the most important lesson in their lives - they learn to accept discipline. *For those puppies that don't get teeth until they are 7 weeks old, this period may last an additional two weeks. They can't learn bit inhibition with no teeth! 7-12 weeks -Human socialization period. The puppy now has brain waves of an adult dog, but his attention span is short. This is the period where the most rapid learning occurs. Learning at this age is permanent, so this a perfect time to start training. Also, this is the ideal time to introduce the puppy to things that will play an important part in his life. Introduce the puppy to many different people, places, animals, and sounds in a positive, non-threatening way. 8-11 weeks - Fear imprint period. Avoid frightening the puppy during this period. Any traumatic, frightening, or painful experience will have a more lasting effect on the puppy than it occurred at any other time in its life. Avoid any elective surgery at this time. Please note that this is the time that ears are cropped. Wait until at least 12 weeks for cropping. 13-16 weeks - Seniority classification period or the age cutting. Puppy cuts teeth and chews on everything! Puppy begins testing who is pack leader. You must discourage any and all biting and rough play because this is a sign of dominance. A quick pinch of the pup's lip while staring him in the eye and hollering in his face works well for most pups. It is important that you are a strong and consistent leader. Formal training must begin. Such training will establish your leadership. 4-8 months - Play and flight instinct period. The puppy may wander and ignore you. It is very important that you keep the puppy on a leash at this time. The way you handle the puppy at this time determines if the puppy will come to you when called. At about 4 1/2 months, the puppy loses the milk teeth and gets adult teeth. That's when the pup begins serious chewing! Dog's teeth do not set in the jaw until 6-10 months. During this time, the pup has a physical need to exercise their mouth by chewing. 6-14 months - Second fear imprint period or fear of new situations period. Dog again shows fear of new and even familiar situations. Dog may be reluctant to approach someone or something new. It is important that you are patient and act very matter of fact in these situations. Never force the dog to face these situations. DO NOT pet the puppy or talk in soothing tones when the puppy is frightened. This is considered praise for being frightened. Training will help the dog's confidence. Spay or neuter your pup during this time. 1-4 years - Maturity period- You may encounter increased aggression and renewed testing for dominance. Continue to train your dog during this period. ​1. 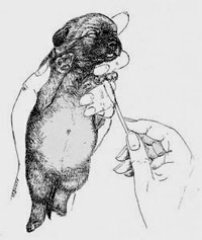 Tactical stimulation (between toes): Holding the pup in one hand, the handler gently stimulates (tickles) the pup between the toes on any one foot using a Q-tip. It is not necessary to see that the pup is feeling the tickle. Time of stimulation 3 - 5 seconds. ​2. 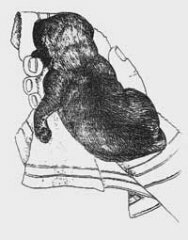 Head held erect: Using both hands, the pup is held perpendicular to the ground, (straight up), so that its head is directly above its tail. This is an upwards position. Time of stimulation 3 - 5 seconds. ​4. 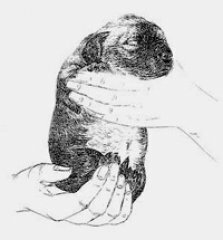 Supine position: Hold the pup so that its back is resting in the palm of both hands with its muzzle facing the ceiling. The pup while on its back is allowed to sleep. Time of stimulation 3-5 seconds. 5. Thermal stimulation: Use a damp towel that has been cooled in a refrigerator for at least five minutes. Place the pup on the towel, feet down. Do not restrain it from moving. Time of stimulation 3-5 seconds. These five exercises will produce neurological stimulation that do not naturally occur during this early period of life. Experience shows that sometimes pups will resist these exercises, others will appear unconcerned. In either case a caution is offered to those who plan to use them. Do not repeat them more than once per day and do not extend the time beyond that recommended for each exercise. Over stimulation of the neurological system can have adverse and detrimental results. These exercises impact the neurological system by kicking it into action earlier than would be normally expected. The result being an increased capacity that later will help to make the difference in its performance. Those who play with their pups and routinely handle them should continue to do so because the neurological exercises are not substitutions for routine handling, play socialization or bonding. In tests of learning, stimulated pups were found to be more active and were more exploratory than their non-stimulated litter mates over which they were dominant in competitive situations. Secondary effects were also noted regarding test performance. In simple problem solving tests using detours in a maze, the non-stimulated pups became extremely aroused, wined a great deal, and made many errors. Their stimulated litter mates were less disturbed or upset by test conditions and when comparisons were made, the stimulated litter mates were more calm in the test environment, made fewer errors and gave only an occasional distress when stressed. Been on 7 different types of surfaces: carpet, concrete, wood, vinyl, grass, dirt, gravel, wood chips, etc. Played with 7 different types of objects: big balls, small balls, soft fabric toys, fuzzy toys, squeaky toys, paper or cardboard items, metal items, sticks, hose pieces, etc. Been in 7 different locations: front yard, back yard, basement, kitchen, car, garage, laundry room, bathroom, crate, etc. Met and played with 7 new people: include children and older adults. Been exposed to 7 challenges: climb on a box, go through a tunnel, climb steps, go down steps, climb over obstacles, play hide and seek, go in and out of a doorway with a step up or down, run around a fence, etc. Eaten in 7 different locations: crate, yard, basement, laundry room, living room, bathroom, etc. We also combine the above programs with the Von Falconer Program. We follow this program on any puppy here until a year old (or until they go to their new home). We hope that new puppy owners will be able to continue some of this training. We also have read and recommend to all new owners, "Another Piece of the Puzzle: Puppy Development" by Pat Hastings and Erin Rouse. Dog owners guide - great site!